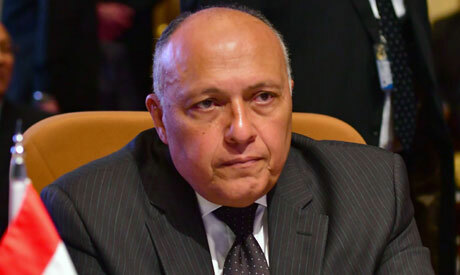 Egypt’s Foreign Minister Sameh Shoukry travelled to Brussels on Tuesday to participate in a “mini-summit” on Syria with Western and Arab countries. In an official statement, foreign ministry spokesman Ahmed Abu Zeid said Shoukry will participate in the select meeting on Syria for the first time with the foreign ministers of the US, France, the UK, Germany, Saudi Arabia, and Jordan. According to Abu Zeid, the meeting will include discussions on the latest developments in Syria, especially escalations in the south and the north; and about efforts made by the UN special envoy to Syria Staffan de Mistura in cooperation with international and regional partners to reach a political resolution to the crisis according to UN Security Council resolutions, including Resolution 2254. Resolution 2254, adopted in 2015, outlines a road map for the peace process in Syria, setting out a timetable for UN-sponsored talks between the Syrian government and opposition members, as well as the outlines of a nationwide ceasefire to begin as soon as the parties concerned take initial steps towards a political transition. De Mistura will also brief the attendees of the results of his consultations carried out to establish a constitutional committee, with the identification of its mandates and terms of reference. Abu Zeid said this participation came due to Egypt’s active role through its extended talks with different regional and international partners to put in place a political solution for the Syrian crisis and stop the bloodshed to preserve the entity and unity of the Syrian state and the safety of the Syrian people.